Arcadia outlasts Monrovia: After a loss in the opening set, the Arcadia High girls volleyball team swept the final three set and came away with a 3-1 victory over visiting Monrovia on Tuesday night in the first round of the CIF Southern Section Division 3 playoffs. Both teams lost last year in the quarterfinals and had their sights set on advancing further this season. With the 22-25, 25-12, 25-17, 27-25 win, the reward for the Apaches is going up against the No. 1 seed in the playoffs. La Salle (22-5), which has won the last 10 matches in a row, will host the second-round match on Thursday. 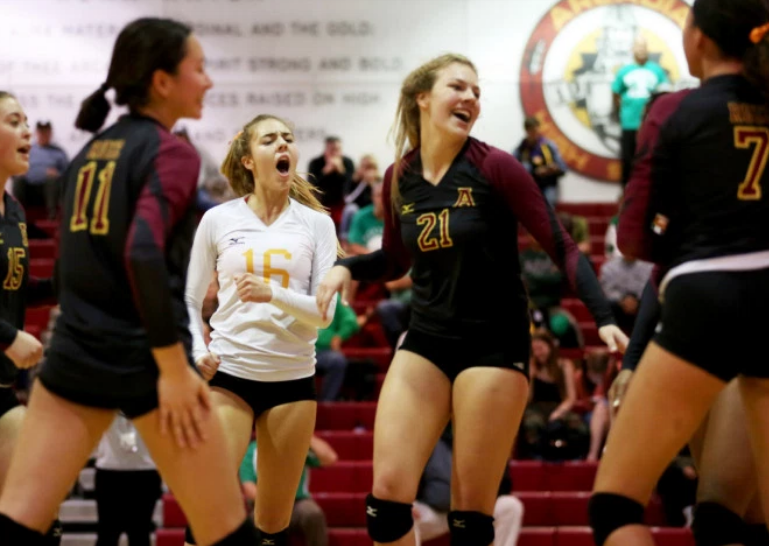 California’s hot streak continues: After finishing last in the Del Rio League one year ago, the California High girls volleyball team shook off the nerves of playing in its first CIF-Southern Section Division 6 playoff game on Tuesday night. The lack of experience on behalf of the Condors certainly showed in the match’s opening set against visiting La Mirada.CalHi coach John Horowath called his second timeout of the first set after the team fell behind four points and looked like it was going to drop the match’s opening set. Corona Santiago at Glendora, 7 p.m.
St. Lucy’s 9, Westminster La Quinta 9, St. Lucy’s wins on games. El Rancho 9, San Dimas 9, El Rancho wins on games. La Mirada 9, Santa Paula 9, La Mirada wins on games. 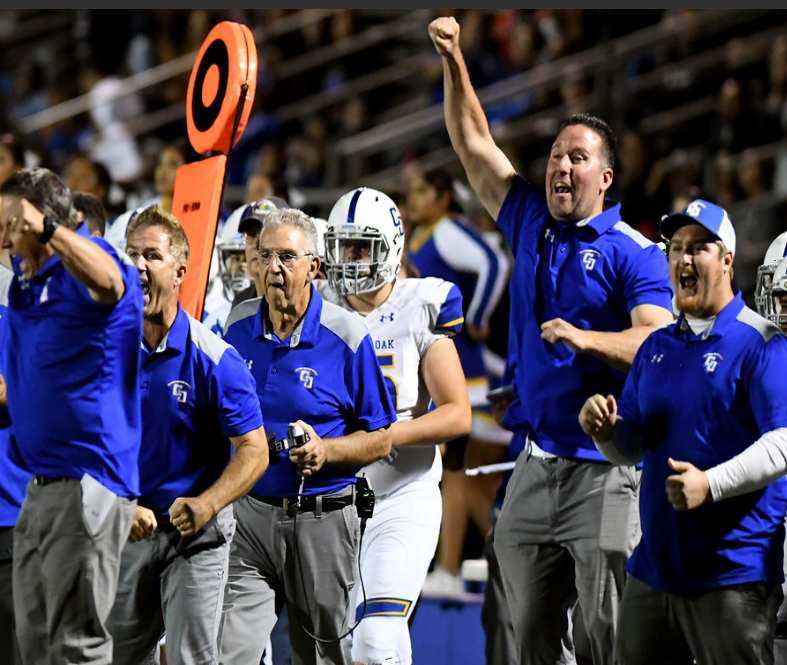 Ten Burning Questions: Will Bishop Amat and St. Francis bring home league titles? 1. Who wins the Mission League championship game between Bishop Amat and Chaminade? 2. Who wins the Angelus League championship game between Cathedral and St. Francis? St. Francis. The Golden Knights, in my opinion, are the best team in Division 3 and will prove it Friday at home. Junior quarterback Darius Perrantes was absolutely stellar (10-13, 276 yards and 4 touchdowns) in St. Francis’ win over Harvard-Westlake last week. The key to this game will be how well the offensive line of St. Francis performs against Cathedral’s elite defensive line. The Phantoms have had issues with their offensive this year and that has to be shored up if they any plans on winning. 3. Who wins the Freeway League championship game between La Habra and Fullerton? La Habra. Since 2004, the Highlanders have won 64 of their last 66 game Freeway League games. That is the ultimate definition of dominance. Senior quarterback Zach Fogel has thrown for 1,467 yards with 16 touchdown passes. They face a Fullerton team that is riding a six-game winning streak. The key for the Highlanders defense is containing senior running back Dylan Nicholson who has rushed for 1,108 yards this season. 4. Who wins the Montview League Championship between Nogales and Azusa? Nogales. The Nobles were riding high last season before they lost to Azusa which led to their downfall to not being selected for the CIF-SS playoffs. Fast forward a year and Nogales is looking to turn the tables. Ranked second in the current CIF-SS football poll, the Nobles have gotten excellent production from quarterback Joshua Lopez. The senior has thrown for 1,100 yards and Francisco Ibarra has been extremely productive at running back (935 yards rushing, 10 touchdowns). They face an Azusa team that has held league opponents to a combined four touchdowns the last four weeks. 5. Who wins the Prep League Championship game between Rio Hondo Prep and Pasadena Poly? Pasadena Poly. Of all the league championship games, this might be the most competitive. Both teams are evenly matched. The Panthers have used their punishing running attack (1,616 yards rushing) to dismantle teams such as Maranatha, Rosamond and Mary Star of the Sea. They’ll face a Kares team that is always well-coached under one of the more underrated head coaches in the area in Ken Drain. Rio Hondo Prep owns key wins over La Canada (52-0) and Santa Clara (29-0). 6. Can Damien still get an automatic bid from the Baseline League into the playoffs? Yes. If the Spartans defeat Etiwanda on Friday, they’ll be in three-way tie for third place in the Baseline League standings and they’ll carry the automatic bid over the Eagles due to head-to-head criteria. Even if Damien losses, they’ll get into the playoffs with an “at-large” bid due to their record being .500 (a requirement for At-Large consideration). 7. Does St. Paul have a chance of making the playoffs? Yes. In Division 6, there are currently 12 teams that are vying to getting automatic berths from their league. That means there are four “at-large” spots available. With Sonora and Elsinore, the only teams with .500 records or above, St. Paul will be in a pool of three teams (the others being Golden Valley and Canyon High School of Canyon Country) that will be under consideration for the final two playoff spots. A win over visiting Salesian on Friday will go a long way to enhancing the Swordsmen’s resume. 8. How important is it for Muir to win the Turkey Tussle? Very important. Right now, there are 16 teams that are in-line for all 16 playoff spots in Division 9. However, Hemet, who’s tied for third with Beaumont in the Mountain Pass League standings, takes on highly-ranked Citrus Hill. A loss could drop Hemet into fourth place and out of playoff consideration. That would free up a playoff spot for teams petitioning to get in via the “At-Large” process. A win on Friday will help the Mustangs’ resume. Also look for Maranatha, Aliso Niguel and West Ranch to all vie for the “at-large bid” if it’s available. 9. How important is Arcadia’s game with Crescenta Valley? Extremely important. If the Apaches beat Crescenta Valley on Thursday, they’ll get into the playoffs as the second-place team from the Pacific League. If Arcadia losses, it will drop into third and the fate of its season will be in the hands of the CIF-SS football selection committee. As many as eight third-place teams in the Division could be vying for three playoff spots. 10. How significant is the Ayala vs Glendora game on Friday? Very significant. The winner of this game gets the second place “designation” for the league into the playoffs which is important when it comes to pairing teams up. The winner also has a great chance of hosting a first-round game next Friday night. Should be top seed for Division 3 playoffs. Hosting Cathedral Friday for Angelus League title. Travels to Fullerton next for Freeway League title. On road at Chaminade for Mission League title. Could be Division 7 top seed with win over Bonita. Two weeks off before Division 11 playoff opener. Finishes with tough one against Ayala. Facing Crescenta Valley for second in the Pacific. Facing Diamond Ranch for second in Hacienda. Should still qualify for Division 4 playoffs. Lost thriller to San Dimas to force three-way tie in Valle Vista. Can earn piece of Valle Vista title. Beat Bell Gardens for Almont League title. Should be favored against Los Altos. Beat rival El Monte 28-0. Clinched Del Rio League title. Facing Azusa for Montview League title. Lost shootout and Rio Hondo League title to Monrovia. Takes on Pasadena in Turkey Tussle Friday. Saturday Morning Quarterback: The stage is set. It took awhile for Bishop Amat to brush visiting Alemany, but it pulled away from a tie game at half to post a 42-22 victory to set up next week’s Mission League championship game at Chaminade, and now you have to believe the Lancers have a shot. Especially after Chaminade had to sweat out a 40-35 victory over Notre Dame on Friday. 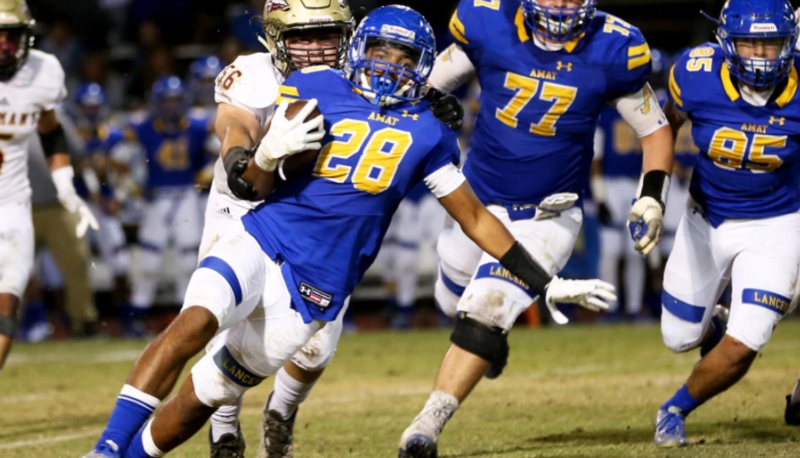 Bishop Amat football keeps rolling in Mission: Bishop Amat’s Blake Archuleta and Damian Moore led a balanced offensive attack while the defense figured out Alemany in the second half in a convincing 42-22 victory over Alemany at Kiefer Stadium on Friday night. The Lancers (5-4, 5-0) travel to Chaminade next Friday, with the winner being the outright Mission League champion. Amat overcame a sluggish start, pulling away with 35 consecutive points after trailing by seven in the second quarter. Monrovia stuns once-beaten San Marino: It was a struggle, but for the 14th time in 15 years, the Wildcats did it again.In a game that saw numerous lead changes, the Monrovia High football team (3-6, 3-0) defeated host San Marino 42-37 on Friday to win the Rio Hondo League championship. The Wildcats were led by Maury Rams IV. The junior carried the ball 22 times for 230 yards and scored three touchdowns. Also turning in an outstanding performance was quarterback Trevor McPherson. The senior completed 9 of 13 passes for 260 yards and two touchdowns. Santa Fe stays undefeated in Del Rio: The Santa Fe High football team came into this season with a chip on its shoulder.After last season’s defensive coordinator and former Chiefs standout Romeo Pellum resigned, it was presumed that the team might suffer a setback in 2017. That notion quickly became an afterthought once Del Rio League play kicked off when the Chiefs knocked off reigning champion La Serna. La Serna continues to roll: After a loss in the first game of the Del Rio League football season to current leader Santa Fe High School three weeks ago, La Serna has been on a major scoring frenzy, scoring 136 points while winning three consecutive games. 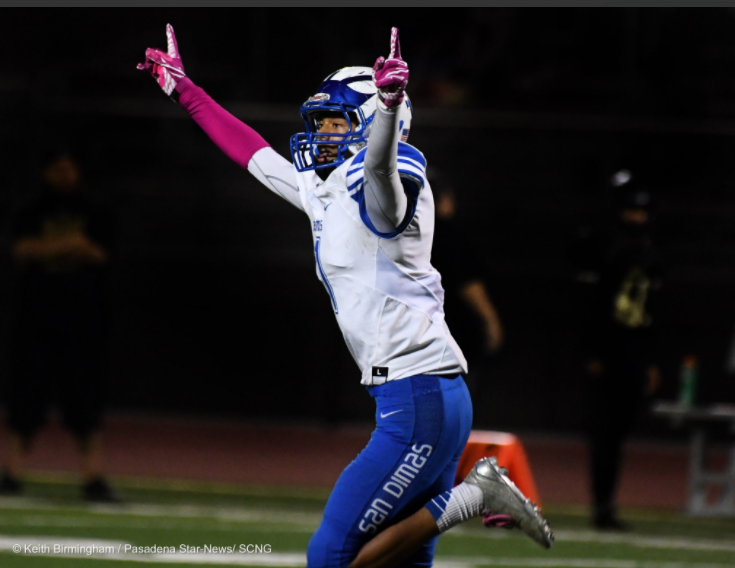 The latest was a 42-17 win over visiting El Rancho on Friday night at California High. “That first game is in our rear view mirror and it’s definitely taught us a lot about ourselves,” said La Serna coach Andy George about the DRL opening loss. Muir rally comes up short: The Muir High football team came into its game against Burbank with a chance to solidify its case to make the CIF-Southern Section Division 9 playoffs, assuming it could pull off the upset win against the Pacific League’s first place team. Muir was certainly up to the challenge and nearly had a chance to tie or win the game in regulation. However, the Mustangs fell seven yards short, losing 38-31 on Friday night. San Dimas ends Northview’s streak: In one of the most exciting local high school games in recent years, it came down to the last five yards, and San Dimas, behind five rushing touchdowns from senior Dylan Ware, defeated Northview 48-42 in a Valle Vista League game Thursday night at Covina District Field. With less than a minute remaining in the game, the Vikings drove the length of the field, highlighted by a 52-yard pass by senior quarterback Steven Comstock to to sophomore wide receiver Damion Thompson that put the ball at the Saints’ 25-yard line with 15 seconds remaining. A couple of plays later, Comstock spiked the ball to stop the clock, but two running plays were stopped, and San Dimas ended an 18-game league winning streak by the Vikings (6-3, 3-1), who came into the game ranked No. 6 CIF-SS Division 8. St. Francis flexes its muscles in win: All season long, the St. Francis High football team hasn’t been shy about lighting up the scoreboard. It only took seven plays Thursday night to confirm that. In that stretch, Elijah Washington scored on the game’s second play and Darius Perrantes threw a touchdown pass then ran for another. St. Francis kept its offense rolling, beating Harvard-Westlake 77-27 at home to set up a first-place Angelus League showdown with Cathedral next week. Jose Estrada delivers for Whittier football in victory – Whittier High School’s Jose Estrada had never kicked a field goal coming into Thursday night’s Del Rio League game against Pioneer. With Cardinals starting kicker Joshua Carranza not in uniform for the team’s home game against the Titans because of a recruiting trip, coach Visko Ancich had no other choice but to go with Estrada.Although the first-year football player had no prior experience going into the 20-yard attempt with 6:47 remaining in the game, Estrada got just enough on the kick to get the ball to split the uprights.